Legislators are currently on a two-week spring break. They will return on Tuesday, April 9 and are scheduled to meet through the end of June. With the budget about a month behind schedule thanks to the new administration, the legislature may need to stay in session through July and maybe even August. Once the House and Senate start approving their versions of the budget towards the end of April we’ll have a better idea of how much negotiation will need to occur between the legislative and the executive branches. While you wouldn’t know it looking at the calendar full of meetings we’ve had with legislators, it’s been a fairly quiet spring in terms of legislation. For MRA, the beginning of each new session is full of “meet and greet” meetings with new legislators and getting to know new committee chairs/leadership. Those meetings filled our scheduled through the end of February and then we shifted our focus to working on proactive legislation and addressing bills introduced by legislators. To put the slower than usual spring in perspective, this year the House has only passed 29 bills and the senate has passed six bills. Only two bills have been enrolled and sent to the governor’s desk and only one has been signed into law. Compare this with last session where by this time, the House had passed 37 bills and the Senate 71 bills. 24 bills had been enrolled by the same time and 22 signed into law. In former Gov. 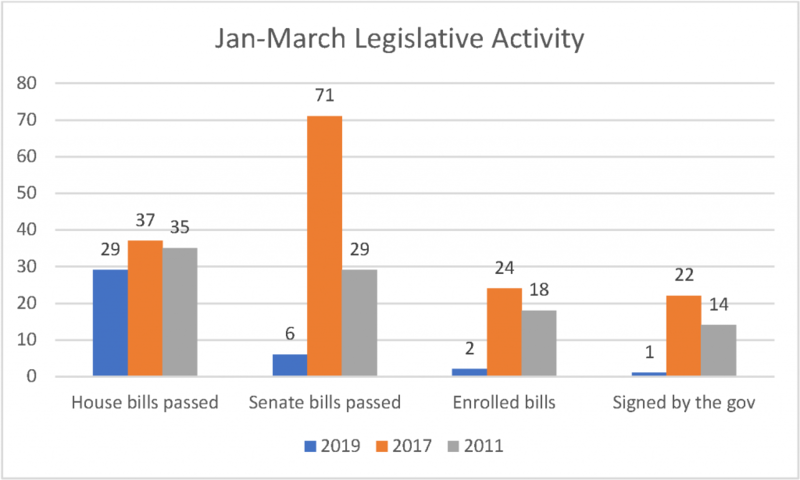 Snyder’s first term (2011) the House had passed 35 bills and the Senate had passed 29 bills.18 bills had been enrolled and 14 had been signed into law. This could be due in part to the changes in the committee process in the house where they’ve added a secondary review committee system. It is more likely due to divided government. The Republican controlled legislature and Democratic administration are still determining which items they can work together on jointly. The 20-cent question: which law changes take effect on March 29? Michigan’s minimum wage will increase from $9.25 an hour to $9.45 an hour beginning on Friday. Employers with more than 50 employees must also begin offering 40 hours of annual, paid medical leave benefits to full time (non-seasonal) employees. There is also an updated minimum wage poster and paid medical leave posting requirement (see story below). Thanks to updates to Michigan’s minimum wage and new paid leave benefits that take effect on March 29, employers must update their labor law posters. In addition to the changes in employee benefits, the state has updated its minimum wage poster and added a new paid medical leave poster. These posters are required by law to be posted somewhere visible to all employees (typically located in the break room, back room or near employee bathrooms). MRA members receive free labor law posters as a member benefit and updated posters are in progress. However, we are waiting to see if the courts will weigh in on the laws that may result in any changes. Meanwhile, MRA members can print off the PDF posters provided by the state to stay in compliance. Replace your minimum wage poster (3rd column, 2nd row) with this updated poster. Add the paid medical leave poster. Michigan Attorney General Dana Nessel said yesterday she would follow the tradition of the office and not issue an opinion on an issue that is currently before the courts. The legislature asked the Michigan Supreme Court to review the legality of the process used to adopt and amend the laws last year. Nessel was asked last month by a state senator to opine on the legality of the minimum wage and paid leave changes that take effect on Friday. Her decision to not weigh in while the issue is before the Michigan Supreme Court follows precedent set by previous AGs. Nessel’s statement does signal that she will likely issue an opinion if the Michigan Supreme Court does not take up the review. E-cigarette sales to minors: Legislation to ban sales of e-cigarettes and vapor products to minors was recently reported by the Senate Regulatory Reform Committee. SB 106 would increase the penalties for selling to minors from $50 per violation to up to $100 for a first offense, up to $500 for a second offense and up to $2,500 for a third or subsequent offense. A similar bill, HB 4164, was also reported by the House Regulatory Reform Committee. The bills received push back from the American Heart Association, American Cancer Society, and American Lung Society who all want vapor products to be classified as tobacco. Next steps: Senate floor/House Judiciary Committee. MRA Position: Support. Liquid nicotine sales: SB 155, recently approved by the Senate Regulatory Reform Committee would require liquid nicotine containers be sold in child-resistant packaging and require retailers sell these and other vapor products behind the counter. Violating the packaging requirements is a $50 civil fine and violation of selling the products not behind the counter would be a $500 civil fine. Next steps: Senate floor. MRA Position: Support. Pregnancy and alcohol warning posting requirements: The House approved legislation that would require retailers selling alcohol to post a warning of the potential problems of drinking alcohol during pregnancy. MRA was successful in getting an amendment added to HB 4112 to add clarity in requiring the new warning be on an existing posting requirement. We’ve been told the bill is unlikely to be taken up in the Senate. Next steps: Senate Regulatory Reform Committee. MRA Position: Neutral. Criminal history: Legislation to make it illegal for an employer to request information related an arrest, criminal accusation or criminal convictions of a job applicant before making a conditional offer of employment was recently introduced as HB 4326. The bill creates a new act but is unlikely to see legislative action. Next steps: House Commerce and Tourism Committee. MRA Position: Monitoring. Minimum wage increase: Legislation that seeks to create a $16 minimum wage for individuals with five years relevant experience and a high school diploma or equivalent credential was recently introduced as SB 233. It is highly improbable that this bill will move, especially given the committee it was referred to. Next steps: Senate Government Operations Committee. MRA Position: Oppose. Dextromethorphan sales to minors: Recently introduce legislation, HB 4412, would limit the sale or purchase of cold products that contain dextromethorphan to minors. Dextromethorphan is typically found in cough syrups. The bill contains penalties for intentionally selling to minors ranging from a warning letter for a first offense to a civil fine of $100 for a third or subsequent offense. Under the bill, minors who attempt to purchase these products could receive a $50 civil fine. MRA requested the bill sponsor consider adding time for pharmacies and stores to update POS systems and inform staff of the change. Next steps: House Health Policy Committee. MRA Position: Support with reasonable time to implement. E-prescribing: Legislation MRA requested to ensure all prescriptions are sent electronically to the pharmacy was introduced last week as SB 248. The bill mirrors HB 4217 and gives us a chance to discussion the issue in both chambers. Next steps: Senate Health Policy Committee. MRA Position: Support. Data breach notification: HB 4186-4187 were reported from the first committee, House Financial Services, unanimously on March 13. The bills would require businesses who have a data breach directly notify customers of that breach within 45 days after confirmation of a breach. We believe the Ways and Means Committee (a new secondary review process this year) will make the changes MRA is seeking on the legislation. There is no urgent timeframe to bring up the bills – the earliest will probably be end of April. Next steps: House Ways and Means Committee. MRA Position: Oppose. Seeking amendments. Drones: Legislation to allow a local unit of government to regulate drone use was approved by the Senate Transportation and Infrastructure Committee last week. SB 129 is mainly focused on Mackinac Island and the unique challenges drones present to the car-free island that is powered by horse-drawn carriages. Next steps: Senate floor. MRA Position: Support. Internet gaming: The House Regulatory Reform Committee reported bills earlier this month that would legalize online gaming. The bills, HB 4173, HB 4308-4312 & HB 4323 were discussed in a committee hearing on March 12 and reported the following week. They are reintroductions of legislation approved last term but vetoed by outgoing Governor Rick Snyder. Next steps: House Ways and Means Committee. MRA Position: Monitoring. Repeal no stricter than federal provision: Legislation that seeks to repeal a law passed last year prohibiting rules stricter than federal standards was introduced as HB 4386. It is highly unlikely the legislature will overturn a law it recently approved. Next steps: House Oversight Committee. MRA Position: Monitoring. Entertainment tax: Legislation that would create a new 10 percent excise tax on the admission charge for entertainment events for things like museums, zoos, professional sporting events, concerts, amusement parks, botanical gardens, and other cultural events was recently introduced as SB 235. The bill would exempt K-12 school events, collegiate athletic events and events sponsored by a nonprofit or charitable organization. Funds would go towards police and firefighter’s retirement benefits in the community where the event occurred. This bill is highly unlikely to move. Next steps: Senate Finance Committee. MRA Position: Monitoring.